This book has been on my to-read list since it first came out. I love the title, and the story of this man’s life intrigued me. It took me a while, but I finally got to it. In the meantime, I have seen other great reviews for this book. I’ve provided links to them at the end of this post. You can also go over to Josh Hanagarne’s site and check it out yourself. 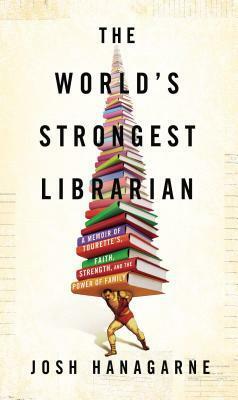 As I was reading The World’s Strongest Librarian, I was thinking that it was a pretty great story. I was laughing, I was crying, I was learning about the Mormon faith, and I was learning more about Tourette’s and what it’s like to live with it. Josh Hanagarne is funny and smart, but I was wondering what I would be able to offer in a review that hadn’t already been said. Then I got about three quarters of the way through the book when I got to the chapter about libraries and how important they are, and the words I have been waiting for. Josh Hanagarne is a librarian in Salt Lake City and he has included lots of great stories about his time as a librarian, but in chapter 10 he talks about the importance of libraries in today’s world and I love everything he has to say about it. The four million small acts lead to members of the community gathering in the same place. People who might never lay eyes on one another elsewhere. In this digital era when human contact sometimes feels quaint to me, this is significant. If libraries themselves become quaint because they house physical objects and require personal interaction at times, so be it. For that reason, I believe physical libraries always need to exist in some form. I hope you know what you have here. It’s a miracle. The man from Nicaragua was right. I had faith in the library long before he walked in and told me what I already knew: a library is a miracle. A place where you can learn just about anything, for free. A place where your mind can come alive. As a librarian, saving lives and worlds isn’t in my purview, …. Saving minds, however… perhaps it’s not as farfetched. A mind can be lost without its owner’s death. A mind that no longer questions only fulfills the rudimentary aspects of its function. A mind without wonder is a mere engine, a walking parasympathetic nervous system, seeing without observing, reacting without thinking, a forgotten ghost in a passive machine. At its loftiest, a library’s goal is to keep as many minds as possible in the game, past and present, playful and in play. … a good library’s existence is a potential step forward for a community. If hate and fear have ignorance at their core, maybe the library can curb their effects, if only by offering ideas and neutrality. One of the profession’s buzzwords is “relevant”. Libraries must stay “relevant”. I disagree. There’s nothing relevant about this place. It’s so much more. A community that doesn’t think it needs a library isn’t a community for whom a library is irrelevant. It’s a community that’s ill. Speaking about his son: He quivers when we walk into the library. I was that kid. I’m still that kid at heart. That’s a definition of “essential” that works for me. To see the value of a library, ignore the adults. Find an inquisitive child who doesn’t have an iPhone yet, take them to the library, and tell them that they can learn anything they want there. About his mother: She’s part caterpillar, weaving a lovely cocoon of euphemisms around herself, giving purpose to life and seeing the best in things. About his new son: There was something in my life that I knew I would die and kill for without hesitation. It was empowering and terrifying and humbling. Another thing I love about this book are all the references in it to great books and authors Josh Hanagarne has read. He talks about the books he was reading at different times in his life and how they influenced him. Stephen King, growing up. Mark Twain’s comments on Mormon women (ha!). In his adoption application interview; Cormac McCarthy, Nathanael West, Chuck Palahniuk, and Stephen King again. In his plea for the importance of libraries; a quote from John Irving’s A Prayer for Owen Meany and a description of George Orwell’s essay “A Hanging“. His references to these (and many others) peppered throughout his book make the story even more enjoyable to read. It’s like reading a great story while getting book recommendations at the same time! Any book lover would like this. There are so many reasons for someone to read this book. I’m so happy I finally did. You can read other great reviews of this book at The Bookshelf of Emily J., The Relentless Reader, and Blogging For a Good Book. Libraries ARE important. I get so sad when I hear people libraries are no longer needed. Grrrrr. So do I! The library here is in need of renovations or a new location. There has been talk (how I would like to think they are only nasty rumours) that some people are questioning whether we even need one anymore at all. So reading this book was very timely for me. I read this book when it came out last summer and I really didn’t love it, but I liked hearing what the author had to say about libraries. I think that discussion was the strongest part of the book, actually! It was my favourite part of the book too! It would have been nice for the book to have more of it. The title has always attracted me too, add in the bits about Mormonism and Tourette’s and I’m hooked. I just haven’t had time to get to this one yet. There is just not enough time to get to everything quick enough! This book has been on my list for so long! I really should try and get to it in 2014. Thanks so much! And, thanks for commenting- I’m glad you enjoy it!